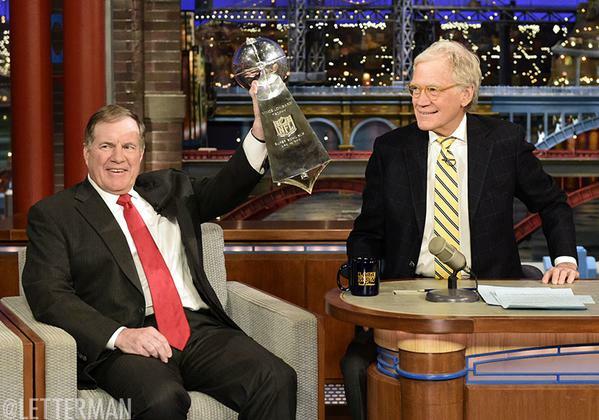 Bill Belichick appeared on The Late Show with David Letterman on Wednesday night to discuss a myriad of topics including Deflategate. The show, which was taped earlier on Wednesday, did its best to display Belichick’s sense of humor. Letterman, a devout Colts fan, shared his views with Belichick on Deflategate including wondering if the Patriots were involved in some horseplay. Say what you will about New England. I can’t remember a world champion enjoying themselves after a victory quite as much as these Patriots. Do you remember when the San Antonio Spurs won the NBA title and made a ton of media appearances after their victory? What about the San Francisco Giants? Outside of Madison Bumgarner, I think the only other Giant to see the light of day was Hunter Pence. Kudos to the Patriots, who are finally letting their hair down for once.